SOF News Update 20181114 – Israel under attack, Norwegian warship sinks, Afghan presidential election, video of Special Operations Policy Forum 2018, elections in eastern Ukraine, movie “Chrome and Hot Leather”, video of OIR briefing by British general, Israeli SOF intel gathering, Navy’s Coastal Riverine Force, Special Operations Low-Intensity Combat Mission Aircraft, Abazaid as ambassador to Saudi Arabia, biometric ‘white papers’ sought by USSOCOM, NSW training in Hawaii, Ryan Zinke in the news, fallen Air Commando honored, first female soldier passes SFAS, and more. First Female Soldier Passes SFAS. The first women to complete the 24-day Special Forces Assessment and Selection (SFAS) course has been selected to attend the Special Forces Qualification Course (SFQC). SFQC is one to two years long depending on MOS and language. (Army Times, Nov 14, 2018). Israeli SOF. The intelligence special operations community has a great intelligence enterprise. Learn more in “Undercover world of the special forces who hear and see all”, The Times, November 12, 2018. Biometric ‘White Papers’. USSOCOM is seeking white papers from the biometrics industry with info about technologies to collect, analyze, and distribute physical parameters that can be used to identify personnel. The PEO-SRSE office at USSOCOM is responsible for the acquisition, fielding, and sustainment of intelligence systems for SOF. Read a detailed report on this white paper request in “USSOCOM, Army look to biometrics industry for new technologies for SOF of the future”, Biometric Update.com, November 13, 2018. NSW Training May Increase in Hawaii. The U.S. Naval Special Warfare Command is looking to conduct joint special operations training in Hawaii. The water-based training includes swimming, diving, launching and recovering submersible small vehicles, and inserting and extracting SOF personnel using watercraft. Read “Joint Military Special Ops Exercises Planned”, West Hawaii Today, November 14, 2018. Fallen Air Commando Honored. One of the crew members of Demise 25, a U-28A aircraft, has recently been honored near his hometown. Major Andrew Becker was the lead pilot of Demise 25. He had his name dedicated to a two-mile stretch of road on U.S. Route 23 in Michigan. Read “Fallen Air Commando honored by hometown dedication”, 27th Special Operations Wing DVIDS, November 13, 2018. Niger Mission – Letter from a Father. The father of one of the members of 3rd Special Forces Group killed in Niger last year writes a letter of support for the Army captain who led the fateful mission. Read “A Letter to the Army: Don’t Punish the Man Who Led the Mission That Killed My Son”, The New York Times Magazine, November 14, 2018. Former Navy SEAL Zinke in the News. The U.S. Interior Secretary says he is “100 percent confident” he will be cleared of ethics violations. (Military.com, Nov 13, 2018). War Crimes Investigation of Navy SEAL. It appears that the investigation into the alleged killing of a prisoner in Iraq is proceeding forward. Read more in “More than a dozen Navy SEALs may get caught up in war crimes investigation”, Navy Times, November 13, 2018. See also a copy of the charge sheet (Task & Purpose, Nove 14, 2018). Special Operations Low-Intensity Combat Mission Aircraft. Is there a secret plane out there that provides deep infiltration and exfiltration duties in very high-threat environments? (The Warzone, Nov 13, 2018). Navy’s Coastal Riverine Force. The Navy is recruiting sailors to serve in its fleet of small boats – among them the Mark VI Patrol Boat. The Coastal Riverine Force (CRF) operates in the harbors, rivers, bays, across the littorals and ashore. Read more in “Think you’re tough? Need a change from the Navy grind? Try one of these squadrons”, Navy Times, November 13, 2018. How Policy Makers Should Use Intelligence. Brian Katz provides a suggestions on how to digest the immense amount of intel available and put it into a concise brief. Read “Intelligence and You: A Guide for Policymakers”, War on the Rocks, November 14, 2018. Report on National Security. A report to Congress by the National Defense Strategy Commission (USIP website) says that the U.S. military would struggle to win a war against China or Russia. Read “A crisis of national security: New report to Congress sounds alarm”, Defense News, November 14, 2018. Editors note: Very little mention of special operations other than the DoD needs to ensure SOF can continue operations in the Middle East. Cordesmen on National Strategy. A senior defense commentator with the Center for Strategic & International Studies (CSIS) provides a scathing critique of American strategic planning over the past few decades. (CSIS, Nov 13, 2018). USMC’s Sniper Shortfall. The Corps is suffering from a shortage of professional marksmen and it may impact the Marine Corps ability to fight and navigate in future conflicts in an urban setting. See “The sniper shortfall: Why the Corps could lose its next urban fight”, Marine Corps Times, November 13, 2018. Army’s ‘Deploy-or-Out’ Rules. A new policy defines what it means to be deployable. 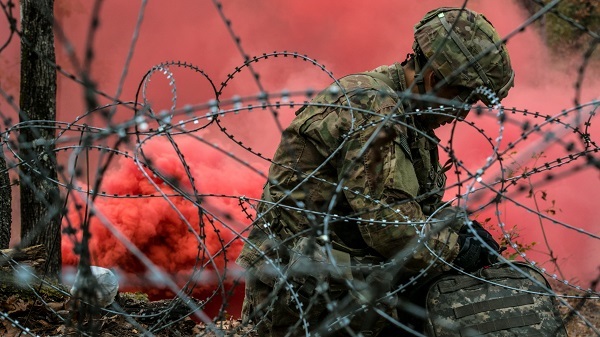 See “Army Releases Deploy-or-Out Rules for Administratively Sidelined Troops”, Military.com, November 13, 2018. Israel Under Attack. An outbreak of violence has descended on Israel once again. The worst since the short war in the summer of 2014 between Hamas and Israel. Israel and Gaza militant groups exchanged fire – with Israel jets attacking positions that launched rockets and mortars into Israeli communities. This is happening at the same time that a group of nations are engaged in an effort to reach a truce agreement in the conflict. Yemen. The U.S. has stopped the refueling of Saudi warplanes that are bombing targets in Yemen – the bombings are reported to be causing civilian casualties. Meanwhile, the port city of Hodeida is undergoing renewed clashes with hundreds of people dying each week. Congress is pressuring the Trump administration to end support to Saudi Arabia and UAE efforts in Yemen. Peace talks is scheduled for December . . . and the Saudi / UAE coalition would like to control Hodeida before they begin. US SOF is involved in the shadows (at times along the Saudi-Yemeni border) . . . not much open press reporting on this aspect of the conflict. New Ambassador to Saudi Arabia. Retired general John Abizaid has been chosen by President Trump to be the ambassador to Saudi Arabia. Abizaid currently serves as a visiting fellow at Stanford University. He retired from the Army in 2007 – his last command was as the head of U.S. Central Command. He is filling a post that has been vacant since Trump took office. Abizaid is an Arabic speaker and is very familiar with the Middle East. He will do well in that position. Advisory Effort. The recent insider attacks taking place in Afghanistan have put the US and NATO advisory effort ‘on hold’. Many of the activities of the advisors – involving travel to Afghan security force bases and meetings with members of the Afghan National Defense and Security Forces (ANDSF) – have been curtailed. The recent attacks by members of the ANDSF on General Abdul Raziq (where General Miller was present) and Major Brent Taylor have caused Resolute Support to halt some advisory missions and reevaluate the security and protection measures for advisors. Bombs Dropped in 2018 – More Than Any Other Year. The Taliban control more territory now than at any other time since their regime was toppled in 2001. One wonders how much territory they would control if the US didn’t conduct air strikes. So far this year the U.S. led coalition has dropped 5,213 bombs (as of mid-Nov) on Afghanistan. This is the highest number recorded by the U.S. military since the conflict began. (Forbes.com, Nov 13, 2018). Victory in Afghanistan . . . Not the Goal. General (Ret) David Petraeus thoughts on the U.S. goals and objectives in Afghanistan are provided in a recent news article by Jamie McIntyre. He believes that while reconciliation is a legitimate aspiration the prospects are slim and the U.S. should be prepared to stay in Afghanistan indefinitely – like we did in Europe and Korea. See “Why victory isn’t the goal in Afghanistan”, Washington Examiner, November 13, 2018. Elections in Eastern Ukraine. The conflict in eastern Ukraine between ‘ethnic Russians’ (with a little help from Russia) and the Ukrainian government forces has resulted in a stalemate. The ‘win’ goes to Putin. Elections were held this past week in eastern Ukraine is a move toward a declaration of independence for the territory. Norwegian Ship Sinks. A warship returning to home port after participating in the huge NATO exercise Trident Juncture held in the Scandinavian region of Europe has sunk after striking an oil tanker ten times its size. How two big ships can run into each other is certainly perplexing . . . unless, of course, if the Russians were messing with the GPS systems in that region. In a related story, read “Norway, Finland suspect Russia of jamming GPS”, GPS World, November 12, 2018. Somalia. A recent bomb blasts in Mogadishu on Friday, November 9th resulted in 53 deaths and over 100 injured. Three bombs went off and then a fourth targeting responders to the first three blasts. In other news, the African Union Mission in Somalia (AMISOM) is going ahead with plans to withdraw this coming February. There is an intent to have a gradual transition of security responsibilities to Somalia security forces over the next few years. Some members of AMISOM are looking to extend the mission but the funding is getting cut by the United Nations and African Union. Boko Haram Update. Nigeria will have to provide humanitarian assistance, economic development aid, and improvement in education – as well as improve its security operations – if it is going to have any chance of attaining political stability and stopping violence in northeastern Nigeria. Read “Intelbrief: Boko Haram evolves but remains a substantial threat in Nigeria“, The Soufan Center, November 14, 2018. Special Operations Policy Forum 2018, New America, November 13, 2018. A host of organizations presented a forum entitled “U.S. Policy for Proxy Warfare”. The forum convened senior U.S. government leaders, leading academics, and national security policy professionals on how to confront the unconventional threats facing Special Operations Forces and how the U.S. military and U.S. government should respond to these threats. Watch the forum online on YouTube. Pararescuemen perform combat search and rescue training at Misawa, 35th Fighter Wing Public Affairs DVIDS, October 31, 2018. Watch a short 1-min video of pararescuemen perform a combat search and rescue training mission during Keen Sword 19. What’s In The Backpack of a Norwegian Sniper?, NATO, November 14, 2018. A Senior Sergeant from a Norwegian sniper platoon reveals what kit he carries to survive in the cold for at least seven days. OIR Official Briefs Reporters, CJFLCC-OIR, November 13, 2018. British Army Major General Christopher Ghika, the deputy commander of strategy and information for the Combined Joint Forces Land Component Command – Operation Inherent Resolve, briefs Pentagon reporters via video teleconference. Chrome and Hot Leather (1971). A B-movie from the early 70s depicting Green Berets in conflict with a motorcycle gang. Directed by Lee Frost and starring William Smith. Watch the trailer (1 min) and view the film (90 mins).